A pie made with frozen rhubarb, strawberries and orange. Put the frozen rhubarb in a large bowl and pour 2 cups of boiling water over it. Let sit for 3-5 minutes, then drain. Add the sugar, nutmeg, ginger and allspice to the drained rhubarb and toss to mix. Cover the bowl and let stand at room temperature for 4 hours. Set a strainer over a large bowl or glass measure. Strain the rhubarb mixture letting macerated juice fall into the bowl. You should get about 1/2 cup plus 2 tablespoons of juice, but if not, add water until you get that much. Put the 1/2 cup 2 tablespoons juice in a saucepan and stir in the zest, orange juice and cornstarch. Cook over medium heat, stirring constantly until the mixture boils and thickens. Boil very gently for another 1 1/2 to 2 minutes, stirring constantly. Let cool to room temperature. Pour over the rhubarb, then mix in the strawberries. Meanwhile, out roll half the pie dough and line a 9 inch pie plate with it. Let the dough hang over the side and put in the refrigerator. 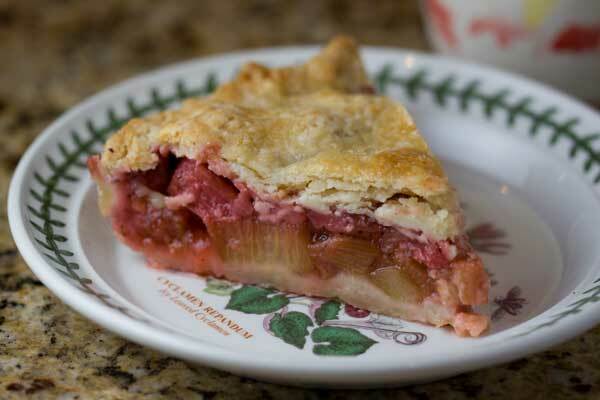 Put the rhubarb filling in the pie plate. Dot with butter. Roll the second round of dough into an 11 inch circle. Lay over the filling and pinch the edges to seal. Cut 6 slits in the top and brush with a little cold water or heavy cream. Sprinkle with sugar. Set the pie on the center rack and set a rimmed baking sheet on the rack below it to catch drips. Bake at 400 degrees for 30 minutes. Reduce heat to 375 and continue baking for another 30 minutes. Note: If top crust has browned after the first 30 minutes, lay a sheet of foil over it. If you want the pie to hold together nicely, chill it after cooling, then cut while cold. Let the slices come to room temperature.